Escape to sunny Sardinia with the perfect summer read! But then Charlotte tells Faye that there's something more behind the sudden invitation: her friends Marisa and Alessandro are looking for a designer to renovate a crumbling old theatre they own in the scenic village of Deriu. The idea certainly sounds appealing to Faye, but little does she know what she's letting herself in for if she accepts this once-in-a-lifetime opportunity . . .
A good easy read, great storyline. Loved the twists and turns. Sardinia is a wonderful place and this book evoked it beautifully. Add intrigue and lost love . A great easy read . 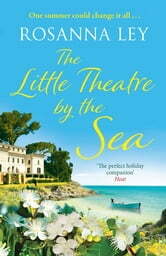 Having travelled in Italy and Sardinia I enjoyed the feel of the book . With a side order of Dorset, it ticked all my boxes . Add a love story or two and intrigue ,perfect escapism. I recommend it .